Yesterday, Apple Inc. (Nasdaq: AAPL) CEO Tim Cook emailed CNBC "Mad Money" host Jim Cramer with a rare mid-quarter stock update on the company's performance. But does Tim Cook's email warrant an all-out SEC investigation? Was the Tim Cook Email Legal? "The SEC will undoubtedly want to take a look at this," Thomas Gorman, a partner at the law firm Dorsey & Whitney, said to MarketWatch on Aug. 24. Gorman defends corporations and individuals facing SEC and other regulatory investigations. 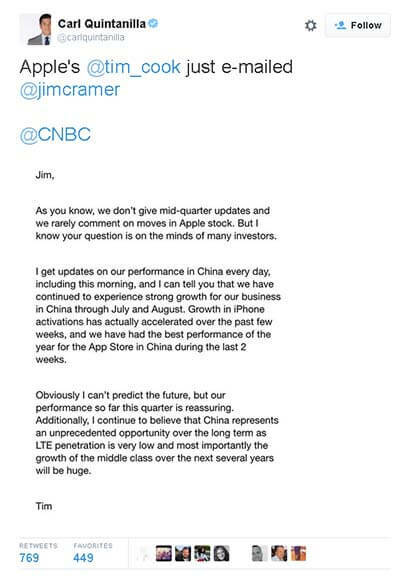 Exactly why did Cook email Cramer in the first place? The move came as a huge surprise given Apple's notorious secrecy surrounding its performance, product-launch events, and quarterly earnings reports. That's one reason Cook's email shocked the public and, most of all, Cramer himself, stated an Aug. 24 article in Entrepreneur. But it also served a purpose – and it doesn't take Steve Jobs to figure out what that purpose was. On Monday morning, the contents of Cook's email were made public via a tweet from CNBC's Carl Quintanilla at 9:03 a.m. Before Cook's email came out, the Apple stock price had hit its intraday low of $92 in the early morning. After the email came out, it rose quickly to an intraday high of $108.80 around 9:45 a.m. The rebound also helped lift the entire Dow Jones Industrial Average from a 1,000-point plummet earlier in the day. You see, while many celebrated the addition of Apple to the Dow Jones on March 18, the stock has a long history of volatility. So while AAPL will help push the Dow higher in boom times, it will help drag it lower during downturns. AAPL's 30-point drop in early morning trading Monday translated to a 200-point drop for the Dow. With global markets plummeting Monday, Cook's email assuaged fears and boosted the company's share price. So what will happen to Mr. Cook should the SEC find him guilty of regulation violation? Bill Singer, a regulatory lawyer, told The New York Times that he expected the SEC to follow through with a full investigation. However, he doesn't believe Cook will be punished harshly, if at all. Cook has no prior history of market manipulation. Follow us on Twitter @moneymorning.com. We in Canada have had chips in our visa cards for a long time along with a pin number. I believe the days of the plastic card will soon be over when apple pay is in full swing with the RF technology from NXPI. They are wasting their money to Put chips in cards?? short lived.